Though it’s often easy to forget, there really was life before the internet. A time in which games existed without the assistance of universal connectivity; a time when the only person ribbing you for your shambolic gaming performance was the dude next to you, not some random jerk with a headset and an axe to grind. Cast your mind back to an age in which there were no patches for broken games, no cloud systems to backup saves and no stay-at-home pro gamers preventing you from that 20-strong killstreak (we’re not bitter, in fact we congratulate sn1per_gHost_Elite _97). It was in this long-forgotten era that the concept of multiplayer meant actually spending time with other people. In person. And it’s within this period of intimate gaming that shooters like Timesplitters 2 redefined the very landscape of the humble console. 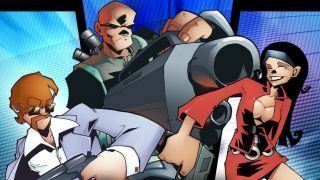 The larger-than-life blaster from the studio then known as Free Radical possessed a frantic single-player campaign that ticked all the right blaster boxes. Touring locales from across time (as well as shooting them to ribbons for equally ill-explained reasons), it was a rewarding and unashamedly fun offering that drank up many an hour of bullet-ridden play. But it’s for the game’s relentlessly inexhaustible multiplayer component that Timesplitters 2 will forever be fondly revered. The age of the split-screen was exemplified by games like Timesplitters 2, and it’s easy to see why. Slicing the screen between you and three of your mates – everyone huddled around the TV in an attempt to get that killer edge – it made playing an FPS more about having fun than the K/D ratio-obsessed shooters of today. Scrambling across maps that were impressively open and varied by the standard of the time, game modes like Gladiator, Monkey Assistant and the infamous Flame Tag were all there to push the multiplayer action to another level. Equipped with a funky art style, this 2002 blast-em-up was the cartoon massacre of your dreams/nightmares. An ensemble of beasts, bots and badasses, ranging from a tiny monkey to giant stone golem, all gave their own advantages in forms of speed Nand resilience, all the while turning kill sessions into a kids’ TV-show gone hideously wrong. Even its interesting art style provided a unique vibrancy of colour to every map – well, we say ‘interesting’, but stop long enough to soak up the detail and personality and you’re likely to get your shins blown off by a shotgun-toting simian. A huge part of the arcade charm the game holds is derived from the weaponry within its mightily impressive cabinet. A formula that games such as Resistance have long-since imitated, Timesplitters 2 possesses a mind-warping armoury of crackpot weapons that help keep affairs endlessly repayable. Not satisfied with the monotony of a deadly assault rifle? Why not try a crossbow or a flamethrower. Still too dull? Fine. Here’s your very own lightning gun and homing launcher. With so many multiplayer-focused shooters on the market today, it’s hard to comprehend a time when games like Timesplitters 2 were a rarity. Yet a throwback to PS2’s golden years provides a glimpse into a gaming landscape where local multiplayer was the order of the day – a time where Timesplitters stood as a glorious testament to how shooters used to be before killstreaks and XP. Thanks to its plethora of creatively designed weapons, frantic pace and unique art-direction, it was also a defiant flick of the Vs to a certain other sci-fi shooter on a rival console. Timesplitters 2: all the fun of a multiplayer match, and not an ethernet cable in sight.